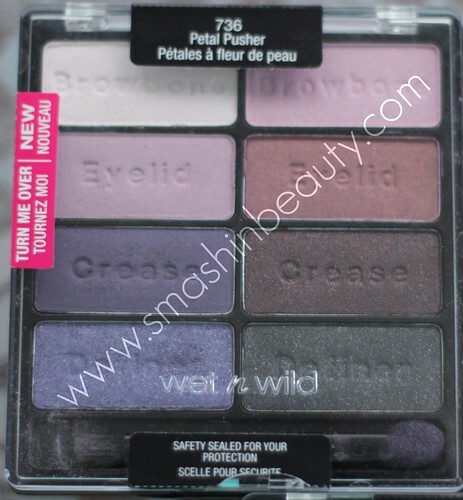 Wet N Wild Petal Pusher is my third makeup review from the Wet N Wild color icon eyeshadow palettes. If you missed the other makeup reviews, make sure to check out my Wet N Wild Comfort Zone and blue had me at hello makeup review and swatches. The most important thing about this Wet N Wild petal pusher palette is that it contains purple shades and is ideal for all eye colors. It offers a wide range of light to dark colors so you can combine the shades for a more subtle day makeup look or for a sultrier darker evening or clubbing makeup look. Just like with the other color icon makeup palettes this one contains eight eye shadows. Now the most important things to mention in the makeup review of Wet N Wild Blue Petal Pusher is that they have the same texture and similar finish as the other Wet N Wild color icon eyeshadow palettes. They are very delicate and sensitive to touch, meaning if you press to hard on them with your eyeshadow brush, you will crack or destroy the eyeshadow. Just like with the other palette the eyeshadows are extremely well pigmented but they also have fallouts when applied and/or touched. Also, just like with all Wet N Wild products, all the palettes are sealed for your protection so that people do not tamper with your Wet N Wild products. 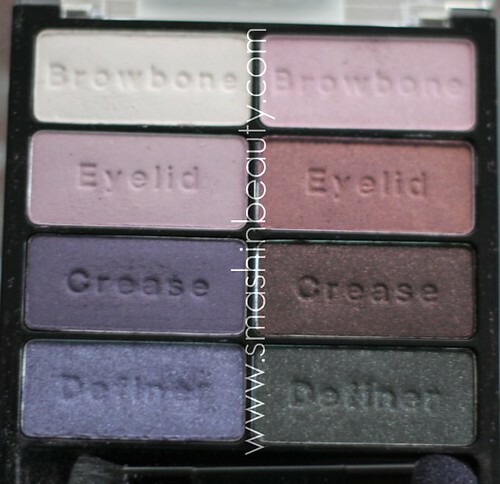 With all Wet N Wild palettes, even this Petal Pusher, you get in the back instructions on how to apply the eyeshadows and where, and on each shadow you have suggestions as to where you can apply each shade. The eyeshadows are very pigmented and long lasting even without a primer. You get 8.5 grams of product in the palette what is a lot considering on how well pigmented the eyeshadows are. With the Wet N Wild Petal Pusher palette you also get an applicator, mentioned in a previous makeup review, I also have to mention that I do not like it and recommend that for the eyeshadows you use your Sigma Beauty eyeshadow brush, which will pick up the eyeshadows better than the applicator. I do have to mention that all of the eyeshadows have a glitter or pearly finish. Sadly, some people might not like this, there is no eyeshadow with a true matte finish. I also wish that the lightest shade were a white shade rather than the pinkish purple shade. Overall to conclude this makeup review of Wet N Wild Petal Pusher Color Icon Eyeshadow Palette, I have to say that this is an excellent palette which gives you yours money worth, if not more. I do however feel that this palette might suit green, grayish and blue shades better than darker eye shadow colors. I do not regret for buying this palette since I know that I will have it for a very long time since the pigmentation is very good. I just wished that like in the Blue had me at hello palette, they at least made one true matte palette instead of having all pearly and glitter shadows. I also wish that they have a true white shadow. I am not sure if I would repurchase the palette since I don’t see myself using these shades a lot.